Alabama debt collection questions - part 17 - what do you do now? 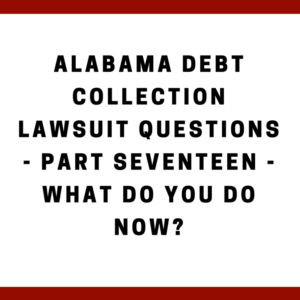 Alabama Debt Collection Lawsuit Questions — Part Seventeen — What Do You Do Now? Our topic today is similar to a “so what?” question. You now know more about debt collection lawsuits in Alabama than almost anyone else — so what? What will you do with that information? Let’s dive right in. I’m just going to be very blunt with you. If you just learned this information and you do nothing, you wasted your time. I’m glad you stuck with me and read through all of this material, but really it does you no good if you don’t take action. You have to have knowledge plus action if you want to have any results. Anything in your life, you need to know what to do and then actually do it. So you’ve got to take action. You’ve got to make a decision. Am I going to file bankruptcy? Am I going to handle this on my own or hire a lawyer? What will I do? Let me make a decision now. Now, we’re certainly happy to help you think through your options. You can call us 205-879-2447 and we will help you think through your options. If you decide you want to hire a lawyer, the natural question is how do you find the right lawyer for you. We talked about this a little bit earlier, but ultimately you need somebody that you feel confident in, that they know what they’re doing, and that you feel comfortable with them. Because this is a journey you’re taking with a lawyer. You’ve got to make sure this is the right lawyer for you. And so, my suggestion is if you don’t feel confident in the lawyer – if you at all say to yourself, “I don’t know if this lawyer knows what he or she is doing,” why would you hire them? If you say, “You know, I think they know what they’re doing but I just do not feel comfortable. I don’t trust this lawyer.” Again, why would you hire that lawyer? Find somebody you feel confident in and that you’re very comfortable with. Keep looking until you find that right lawyer for you. So this is a very legitimate question that I would think about if I was in this position, looking at hiring a lawyer. It is a real risk that you have to consider. I can’t guarantee what a judge will do, but I can tell you that if I’m wrong and I misevaluate this case, then I’ll refund your money to you. And so that’s one way to deal with this, but you certainly need to think about this question, because you don’t want to pay X number of dollars to a lawyer and then get hit with a judgment. Now you’re paying more than the amount you were sued for. So talk to your lawyer about this concern – paying the fee and a judgment if you lose. Obviously, if you’re talking to us, we’ll have this conversation right up front. This is very important for you to know the answer to as you decide what do you do now. It’s like this. If I know how to drive from my house to Atlanta, and I sit in my car and I am packed and ready to go, and I never turn the car on or I never step on the accelerator, how likely am I to get to Atlanta? Zero percent chance I’m getting to Atlanta because I’m not doing anything. If I say, “I need to lose weight. I need to get physically fit,” so I read all these books on fitness but I do nothing, how valuable to me was all that information? I’ve got to know what to do and then take action. You’ve learned an incredible amount of information about debt collection lawsuits in Alabama. Now you need to take action. You’ve got to do something for this to have been worth anything at all for you. The good news is you are committed to taking action. And you just need a little bit of guidance. You can always call us. We’ll do this over the phone. But I understand sometimes people want to do this on their own before they speak with us, and you can request (at no charge – it is free) our checklist/worksheet. There’ll be a place you can enter in your contact information and you can download this little checklist or worksheet. It will help you organize the important dates and help you organize your thoughts on what you want to do – which direction to take. You made it through this long series of articles –– I hope it was helpful to you and I wish you only the best!!! Congratulations! Thank you for taking the time to read through this series and I hope this was helpful to you. We wish you only the best. We want you to be successful. If we can help you in any way, just pick up the phone and call us 205-879-2447. We will have a very friendly casual conversation. Our purpose is to help you — no judging in this conversation. We just want to talk to you, help you evaluate your options, and then help you discover for yourself, not for anybody else, but for you what is the best option, and then we’ll encourage you to take that action. So again, thanks for being with us. You can reach us at 205-879-2447 or fill out our contact form here.